Prior to HTML5, the standard for embedding videos onto your WordPress website, onto any other web page, or making your videos accessible via tablet or mobile phone, required you to use a third party software, mostly notably Adobe Flash Player or the Adobe Shockwave Flash application. These made it so that the computer would be able to run the embedded videos, but in addition to needing the flash player, you would also need to find the complicated embedding code, which would often come from another website that you would then copy into yours. Now with HTML5, a fastly growing standard for web developers, you no longer need a complicated embed code, or require relying on third party applications to make your video run. and that's it. Seems super easy right? Well just like other newer technologies, there are limitations. The limitation comes from the browser support that is required and the video encoding specs. Since HTML5 is still new, it does not have full screen playback currently, and has very simple navigation menu. These menus could be easily changed via skin modification but then you run the risk of it not working in all of your web browsers. In addition to this, the specs currently do not allow for there to be any Digital Rights Management, meaning copyrighted content will not be playable through HTML5 videos, for the present time being. Furthermore, there are only three current ways to encode the video, H.264 (the most popular format), Ogg Theora, and VP8 (WebM) which are not all native to every browser, so using the correct encoding for the browser you will be using is crucial to the playback of the video. Recommended: when encoding your video, convert it into two of the three video formats to ensure successful playback in your web browser. 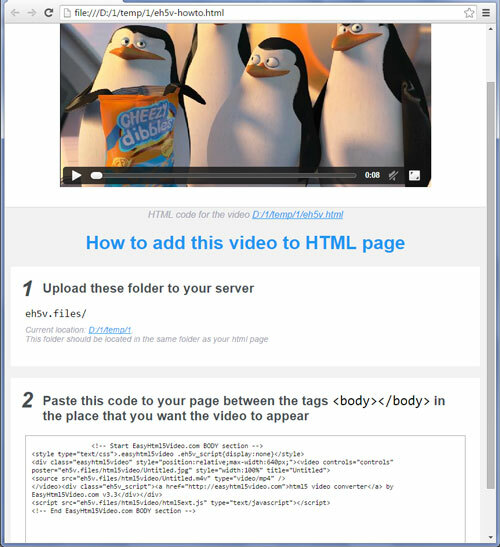 If you are looking to try out HTML5, experiment with videos, or want to make up some sample HTML5 videos, then using EasyHTML5Video (http://easyhtml5video.com) is a great way to get started. It requires three easy steps, drag and drop, tune settings and publish and works on Google Chrome, Safari, Internet Explorer, Firefox and Opera.